Jumping up seems cute when your puppy is a little guy, but when he grows into an adolescent, jumping on people can become more than rude. These juvenile delinquent dogs haven’t learned how to control their excitement and can bruise, scratch or knock down owners when they launch themselves and plow into you with their paws and claws. With small dogs and young pups, these tips to stop jumping up can work. When your puppy reaches adolescence, he may be unable to control his impulses and start to test limits (just like a human child). Adolescent jumping up can turn into “nose boinking” which can lead to broken glasses or even a bloody nose. Jumping up often combines with mouthing behavior where the pup bites and grabs your hands, clothing or even your derriere in a grabbing game of tag. In most cases, a puppy doesn’t mean to be bad and it's simply how he plays. These puppy jumping tips can solve problems with young dogs. When you’ve got a hard-core juvenile delinquent, a new approach can help. Each dog is different so not all work with every pup. Here are 10 tried and true tips from some dog behavior consultants and trainers colleagues to help cool your puppy’s jets. Homecomings and departures are a prime time for jumping up because puppies want to greet you or stop you from leaving. Turning your back on some of these dogs actually revs them up even more, so instead try ignoring the bad behavior. “Ignore” means you make no eye contact, say nothing and stand still like a zombie offering no reaction to silly puppy behavior. When your puppy jumps up, grab her front paws and dance her around the room. Some pups hate this so much that’s incentive enough to stop jumping. However, with other pups that enjoy the dance, it could reward the behavior. If this causes more intense mouthing and biting of your hands, try a different tip. Teach your puppy a conflicting behavior such as “fetch your ball.” She can’t jump up if she’s running to bring you her ball or favorite toy. Just the name of a ​special game or toy—“go get your bear!”—can change the dog’s focus and redirect the behavior long enough for you to evade the jumping. 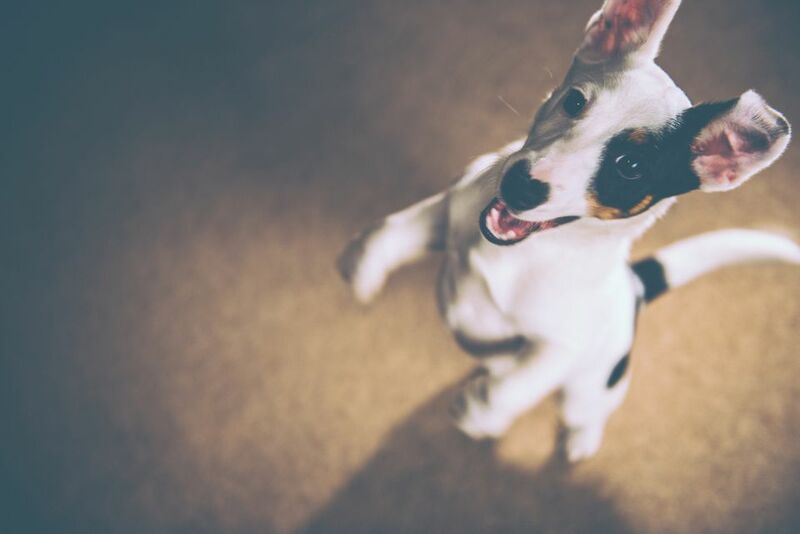 With enough repetition, your puppy will begin to associate your home-coming with “go fetch” instead of jumping up. For pups that ambush you and bite your rear end while playing outside, hide a toy or two in the backyard and ask them to find the toy. Bad weather can give puppies cabin fever when they don’t have adequate time outside to run off the energy. Mental stimulation can wear them out, too. Show your puppy a favorite toy and then roll it up inside an old towel and knot it to make a puzzle. Encourage the pup to unravel and get the toy. You can even tie the first toy-in-the-towel inside a second one for more of a challenge to relieve boredom. A conflicting behavior when you come home—like “sit”—helps enormously. You’ll need to practice your puppy’s “sit” during calm moments first, and then ask for this polite behavior before you leave and when you arrive home. Guests will appreciate a polite “sit” when they arrive, too, as they won’t appreciate your puppy leaping around and mugging them for attention. Many puppies don’t know their own strength. When they jump up and you wave your arms and try to push them off, they may think it’s a game and grab and bite harder. Tell them it hurts the same way another puppy would, with a YELP! Lay it on thick, overact and cry and sob like the pup has done major damage. Some tough dogs really get the message using this. For the out-of-control grabby, ambush type of dog play, give him a taste of his own medicine and SCREAM (very loud but very short), and fall over “dead.” Don’t move and don’t say anything. Play dead for at least 15 to 20 seconds. The shock value may be enough to send a permanent message that such games stop all interaction, plus they hurt you—and playing dogs really aren’t interested in hurting you and won’t want you to cry. 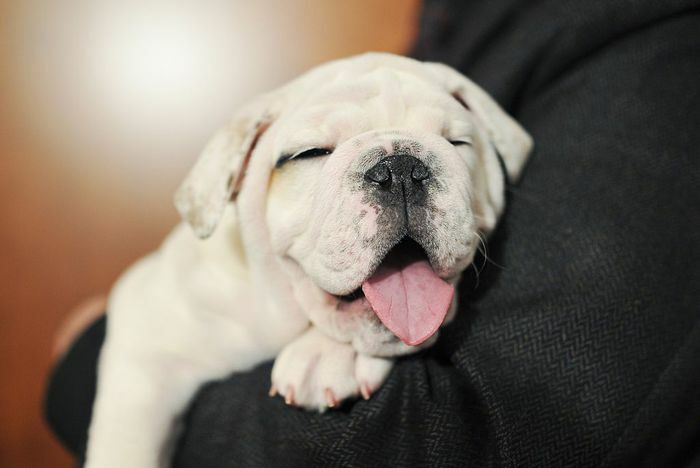 An anxious or playful pup may leap high quickly and suddenly “poke” at your face with their nose. That can be triggered by leaning over the top of them especially when they’re in a high-arousal situation like a homecoming or around other dogs. It may be a way for stressed pups to relieve their anxiety, so be aware of situations that cause these behaviors. Dogs control each others' movement with their body language. Think how a Border Collie makes sheep move just by getting close. You can stop your pup’s jumps by stepping close to him just before he leaps. Cross your arms and step into the pup’s personal space before he crouches to leap. This is a long leash that the pup can “drag” along the ground. When the pup approaches, simply step on the line before he can jump which prevents him from leaping. While you step on the line, don’t make eye contact or give him attention until he stops trying to jump. With a tie-down, you simply attach your dragline to a fixed object like a fence, stair rail or another immovable object like an eye-bolt in the wall. This exercise uses the same principles as teaching the “wait” command, only instead of closing a door or gate, the pup is confined by the leash. That keeps you safe from mouthing and claws and prevents the pup from jumping up and grabbing. Practice puppy sits and downs while you stay out of range. Only reward the puppy with contact from you when he stays calm with all four feet on the floor. Practice the tie-down exercise with several friends. Have them approach, one after another, and only pet the pup if he doesn’t jump. If he tries to leap, back out of range and say, “Too bad!” or something similar. Repeat the exercise 10 to 20 times in a row, and the pup will learn the lesson.